The human body is astonishing. It has the amazing ability to heal and restore its balance with the help of its storehouse of dynamic energies. Alternative therapies are all about channeling these energies to facilitate healing. One such therapy practiced by ancient Chinese healers is Gua Sha. Also known as scraping, coining, and spooning, Gua Sha has the potential to facilitate healing and promote your well-being. Read on to learn more about this traditional practice and how it can help you. Gua Sha (pronounced ‘gwah-sha’) is the technique of scraping your skin with cardboard-like massage tools to improve your blood circulation. The ancient Chinese believed that Qi (pronounced ‘chee’), the positive energy that flows through our body, helps in sustenance. When this flow of energy is blocked, it results in inflammation and illness. The ancient Chinese believed that rubbing the surface of your skin could help restore the flow of Qi through your body and promote healing. This is done using flat cardboard-like tools that are used to apply pressure and scrape your skin. Gua Sha is performed on all parts of the body, including the face. If you google Gua Sha, don’t get scared by the pictures of bruised backs and necks. 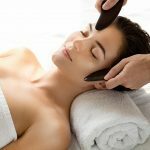 The intensity and pressure of the strokes are much lighter when it is done on your face (Gua Sha facial) compared to the other parts of your body. This technique is extensively used for relieving pain, aches, and muscle stiffness in different parts of the body. However, when it is done on your face, it is incredibly gentle. It feels like the tool is gliding on your skin and only slightly pulling on it. Gua Sha benefits you in a number of ways. Scroll down to the next section to find out more! A study examined the effect of Gua Sha on a patient suffering from inflammatory damage to the liver and increased activity of liver enzymes. It found that the chronic inflammation of the liver was reduced to a great extent 48 hours after undergoing Gua Sha therapy (1). Researchers at Universität Duisburg-Essen (Germany) studied the effect of Gua Sha therapy on a 72-year-old patient suffering from chronic headaches. The patient underwent the therapy for 14 days. The study concluded that Gua Sha was effective in improving headaches, although more clinical trials and research are required to confirm this evidence (2). Tourette’s syndrome is a neurological condition characterized by involuntary and sudden tics (vocal outbursts). A study conducted by the Oregon College of Oriental Medicine examined the effectiveness of Gua Sha in treating Tourette’s syndrome. The participant was a 33-year-old male with Tourette’s syndrome. The patient was treated with acupuncture and Gua Sha along with some lifestyle changes. His symptoms had improved by 70% by the end of the study (3). Gua Sha helps relieve neck pain. In a study involving 48 patients with chronic mechanical neck pain, it was found that the severity of the pain improved after a week of treatment. The study concluded that Gua Sha had an excellent short-term effect on pain management. The long-term effect of Gua Sha in pain management needs further research (4). Perimenopausal Syndrome refers to the phase when your body is transitioning towards menopause or the end of your reproductive years. 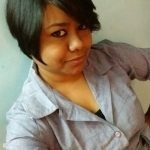 This is the time when the levels of estrogen in your body fluctuate, and you may experience symptoms such as vaginal dryness, sleep issues, and hot flashes. Gua Sha can be helpful during this transition. A study conducted in China observed the effect of Gua Sha on 80 women with Perimenopausal Syndrome. Those who were in the intervention group received 5 minutes of treatment once a week and Gua Sha treatment for eight weeks. The control group received conventional treatment. The symptoms of Perimenopausal Syndrome significantly reduced in the intervention group when compared to the control group. The study concluded Gua Sha was a promising treatment for improving the symptoms of Perimenopausal Syndrome (5). But, before you experience the power of Gua Sha, you need to pick the right tools. Though you can always consult someone who practices Gua Sha, you can also try it at home. You just need to pick the right tools. Here’s a guide that can help you out. When a Gua Sha tool is scraped against your body, the resulting friction produces ultrasonic pulses. The number and frequency of these pulses vary greatly depending on the material used. The higher the number and frequency, the better the resonation. So, check these values before picking your tools. Bian stone is considered the best material for Gua Sha tools as it has a higher value of ultrasonic pulses. When you scrape your skin with a Gua Sha tool, you need to apply a bit of pressure. If you use heavier tools, you don’t need to apply much pressure. If you are using lighter tools (that are made of plastic), you need to apply a lot more pressure. It depends on your preferences, comfort level, and the body part that needs to be treated. Usually, you don’t need to apply much pressure when performing Gua Sha on the face, so you can opt for a lighter tool. 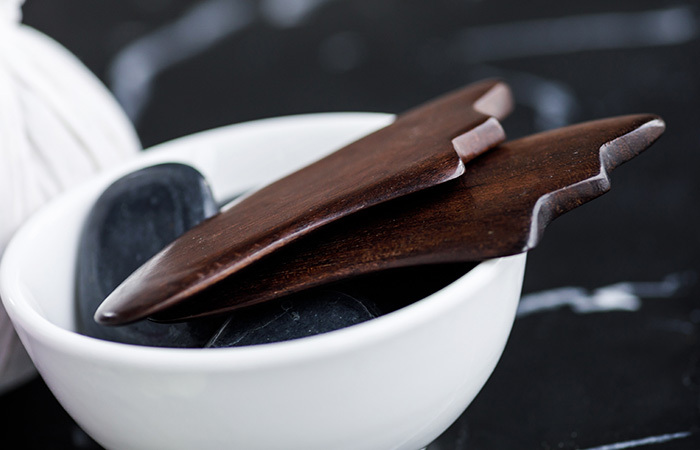 Since you’ll be using your Gua Sha tool for an extended period, it is best to get one that is durable. Check out the detailed breakdown of Gua Sha tools in the next section to get a clear understanding. Bian stone has the highest value of ultrasonic pulses, and that’s why it is considered to be the best material for Gua Sha. Even Ancient Chinese used Bian stone tools for Gua Sha. If you want to do the therapy in the most authentic way, go for Bian stone. If you cannot find genuine Bian stone, buffalo horn is the next best option. In ancient Chinese medicine, buffalo horn was believed to have acrid properties. This acridity is said to help in the flow of Qi throughout the body. It helps to relieve stiffness and get rid of the harmful toxins from your body. However, if you are against animal cruelty (as you should be), consider the following options. The ancient Chinese believed that jade contained positive energy that was very similar to the Qi inside the human body. This is why it is considered ideal for healing. In China, jade is widely used as a healing stone. Stainless steel is another popular choice for Instrument Assisted Soft Tissue Mobilization (IASTM). 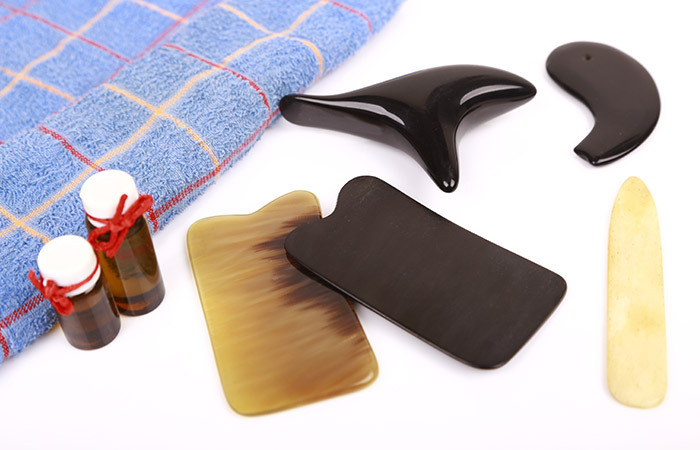 It is a relatively modern tool for Gua Sha treatment. Rose Quartz can assist in opening your heart chakra. It is beautiful and has a delicate pink shade. Gua Sha tools made from rose quartz are extremely smooth, which makes them a bit tough to grip. If you are a beginner, plastic Gua Sha tools are the best for you. Although they are of much lower quality than other materials, they are affordable, easy to use, and readily available. Once you get your tools, it’s time to start with your Gua Sha facial. Here’s a detailed step-by-step guide to a Gua Sha facial. The third eye is the area right between your eyebrows. Start from this point. Use the Gua Sha tool to scrape lightly upwards towards the hairline. Do this five times. Start from the middle of your forehead and gently scrape right above your eyebrows, towards your temple. Repeat this five times. The curved part of the Gua Sha tool is used for scraping the area right under the eyebrows. Start from the inner part of the brow bone and move outward. Do not put too much pressure on your eyes, and try to stay on the brow bone. Scrape the area where you get under-eye bags. Start from the side of your nose and move gently towards your temple. 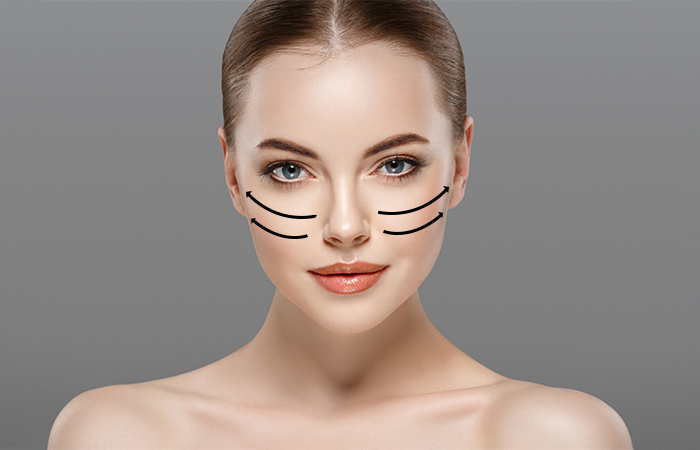 Start from the side of your nose and move the Gua Sha tool across your cheeks, up to your ears. Scrape around the mouth area and sweep it across your cheeks towards your ears. Start right at the middle of the area below your lower lip and scrape the tool towards the bottom of your ears. Scrape the area that’s right under the chin. Start from the middle and sweep it towards your ears. Start scraping from the jawline and down to the middle of your collarbone. In the last step, you need to collect the lymph you moved to the side of your face towards the lymphatic drainage. To do that, start from the middle of your forehead near your hairline and scrape down towards your temple. Then, scrape down towards your ears, your neck, and ultimately, to the terminus area. Repeat this five times. This is an ancient form of healing that helps in managing everyday stress. But, does it has any side effects? Swipe up to find out. Since Gua Sha is a natural healing method, it does not have any side effects. 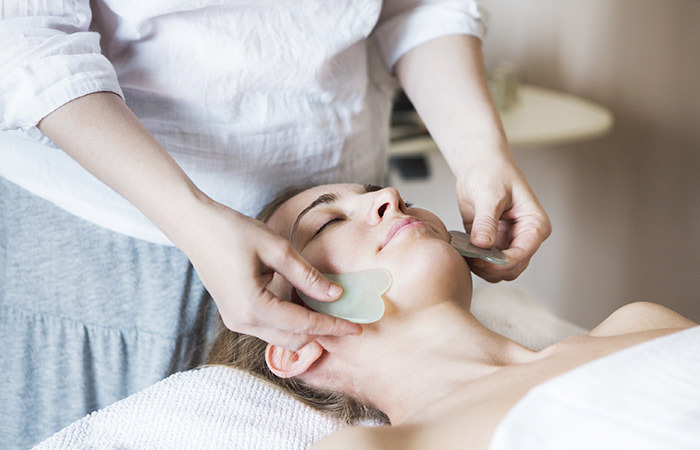 Gua Sha facial is done extremely gently, and it does not affect your facial skin. However, it depends on the way you are doing it. Avoid putting too much pressure to avoid hurting the capillaries closer to the skin’s surface. When it is performed on other body parts, it might cause bruises (again, it depends on how much pressure you apply). Minor bleeding might also occur. However, these disappear within a couple of days. You have undergone any surgery in the last six weeks. You are taking blood thinners or have a clotting disorder. 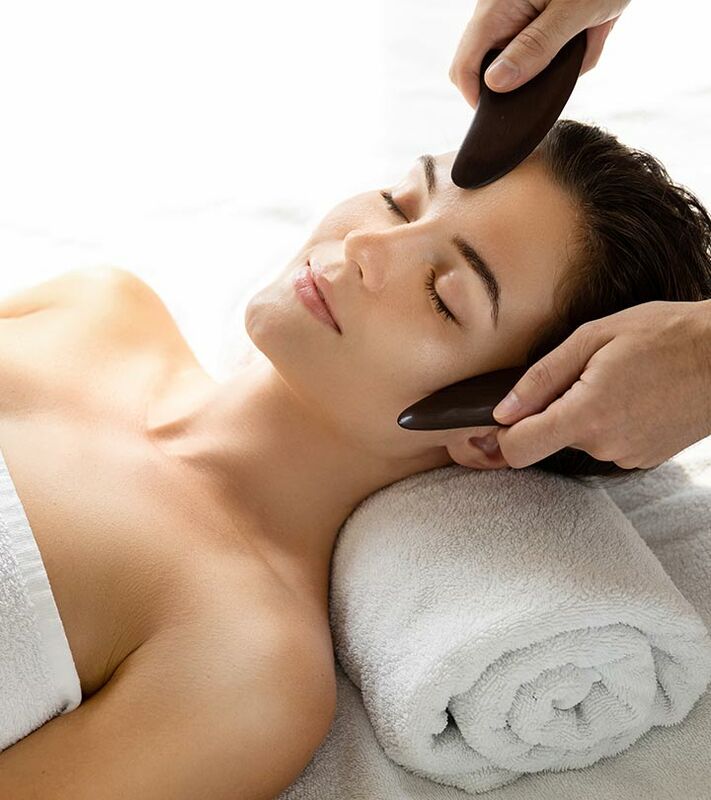 Gua Sha facial is extremely relaxing and can improve the appearance of your skin when done correctly. However, don’t think of it as an alternative to professional treatment for any condition as the long-term effects of Gua Sha on your health and wellness are yet to be researched thoroughly. Are you excited to try Gua Sha facial at home? Do you have any more questions about this amazing alternative treatment? Let us know in the comments section below. “Guasha-induced hepatoprotection..”, International Journal of Clinical Chemistry, US National Library of Medicine. “Gua Sha for migraine..”, Forsch Komplementmed, US National Library of Medicine. “A Single Case of Tourette’s Syndrome..”, Journal of Acupuncture and Meridian Studies, US National Library of Medicine. “Effectiveness of traditional Chinese..”, Pain Medicine, US National Library of Medicine. “Effect of Gua sha therapy on..”, Menopause, US National Library of Medicine.